The crew of the U.S.S. Enterprise-E faced concurrent problems in 2063. The Borg required Picard's attention on the ship while Riker and the away team worked with Cochrane on Earth. 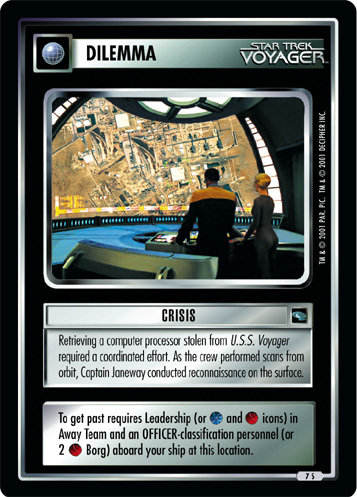 To get past requires Leadership (or and icons) in Away Team and an OFFICER-classification personnel (or 2 Borg) aboard your ship at this location.